In times of financial austerity, all businesses are looking for effective ways to streamline their operations, to maximise efficiency and production and perhaps most pertinently, to reduce their costs. The amount your business spends on administration and office consumables can be difficult to calculate, track and limit, especially in a large organisation where a lot of people make use of them. This makes printing costs in particular an unnecessary drain on your budget. However, by using the right equipment and capitalising on the range of new technologies available, businesses can reduce their expenditure on printing, without compromising on the quality. Taking some time to review the functionality of your printing equipment can pay dividends, particularly if your business relies on printed material to communicate with its customers. 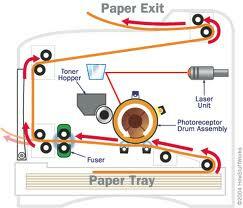 One of the simplest yet effective changes to make is to switch from inkjet to laser printing. Laser printers have a faster print-speed than inkjets, making them an asset in terms of print efficiency and energy consumption and these savings can be maximised with standardised duplex (double-sided) printing which cuts the costs of your paper by half. This instantly reduces the carbon footprint of your company. The technical precision of laser printing gives a sharp, high quality finish which is sustained throughout large print loads. Laser printers can communicate directly with your supplier, which means that when the toner begins to run low or a maintenance task needs to be carried out, a stock delivery or engineer can be scheduled to arrive on your premises. This ensures that you do not experience any gaps in service or an unnecessary build-up of consumables, and this will save you valuable office storage space, time and money. A touchpad screen built into the printer is equipped with password security. This enables individual users to control when a document prints and maintain confidentiality without wasting time standing by the printer. Documents can be sent to the printer via a network but also directly from a USB stick. Documents that are scanned into the printer can be sent to an email address or uploaded directly onto the internet. Individually, these small changes may only make a small difference to your overall spend on office consumables, but when you consider the collective benefits available from just one laser printer, the financial savings to your business over the course of a year can be substantial. The team at CopyLogic have more than twenty years’ experience of helping businesses of all sizes to find the right printing system to suit their individual needs. For further advice or information on how you can reduce your printing costs with a laser printer, contact us on 020 8901 4700.